In the late 1960s Bill Tracy’s attractions focused more on optical illusions, mechanically simpler stunts that required less maintenance, and psychedelic looking façades. Bill was very good at using forced perspective, a technique that uses optical illusion to make an object appear larger, smaller, closer, or farther than it is in reality. In his dark rides he used revolving barrels, diminishing squares, ultraviolet lights, strobe lights, and mirrors to create special effects that caused disorientation for the rider. Bill was known for putting stunts, props, and optical illusions in an illogical sequence that kept the rider confused adding to the overall experience for those who rode one of his dark rides. The mechanically complex stunts, such as Old Mill, Torture Chamber, and Head Slinger of the early to middle 1960s were no longer incorporated into his projects. Bell’s Amusement Park in Tulsa, OK. 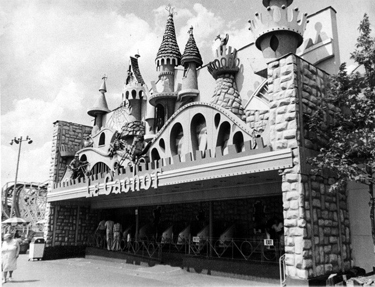 In the early 1970s, while even further simplifying his projects, Bill completed two of his most famous walk-thru attractions. Pirate’s Cove at Trimper’s Amusements in Ocean City, Maryland opened in 1971, and Pirate’s Cove at Waldameer Park in Erie, Pennsylvania opened a year later in 1972. Both of these walk-thru attractions are still in operation today and are Bill Tracy’s adaptation of the traditional funhouse. These two attractions are almost identical and require very little maintenance, as there is no ride system. The façade of both of these attractions portray Captain Hook holding a sword while guarding his precious treasure chest. Although Bill Tracy designed the Captain Hook figures, the fabrication of these enormous figures had to be sub-contracted, as they were well beyond what he could handle at his workshop. 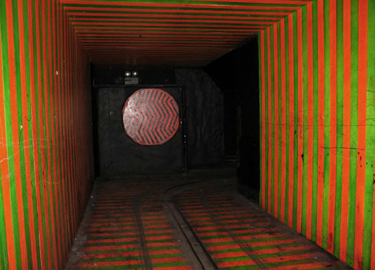 The interiors of these walk-thru attractions were very similar to that of his dark rides of the same era containing diminishing hallways, narrow irregular corridors, revolving mirror balls, and tilted rooms. The interiors also showcase classic Bill Tracy pirates, sharks, and skeletons, which can be viewed at length unlike his dark rides. Waldameer Park in Erie, PA.
Bill Tracy's imagination and creativity was second to none when it came to his ride fronts and they became very vibrant and reflective of the times. On his later Whacky Shack façades Bill used rotating eyes, flower illusions, and scrolling windows to add to the whimsical nature of the exterior. They had a Dr. Seuss meets Scooby-Doo look to them and they rarely made sense visually, although, somehow it all worked together. He also built a rollercoaster-like dip on the second floor balcony, which overlooked the loading area and was visible from the park’s midway. 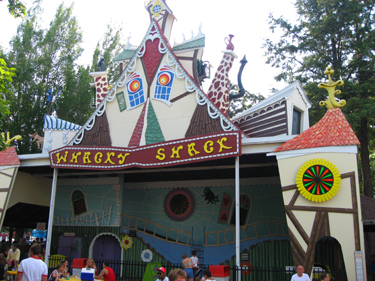 Tracy’s Whacky Shack at Waldameer Park in Erie, PA.
On one of Bill Tracy’s most famous façades, Le Cachot at Kennywood Park in Pittsburgh, Pennsylvania, he used his standard Kooky Castle façade featuring a medieval castle, but also incorporated skeletons wearing armor riding choppers complete with spinning psychedelic wheels. A skeleton playing a guitar and a vampiress also adorned the façade. Le Cachot opened in 1972 and is French for “The Dungeon”, which was probably a phrase that Bill learned while taking French his senior year at Scott High School. Common to the era, Bill was known to have been a drinker and a cigarette smoker which may have helped to stimulate his creative mind when developing and constructing his off-the-wall concepts. Tracy’s defunct Le Cachot at Kennywood Park in Pittsburgh, PA.
Bill also seemed to have a rebellious side to his personality. He would often fabricate one of his props for a particular project to show an obscene hand gesture. The “fickle finger” was present in many of his attractions. Some parks caught on to this practice and warned Bill not to use this offensive gesture on their ride. Bill, however, usually found a way to work it in, even if it was subtle. A very well known display of the “fickle finger” was on Le Cachot. 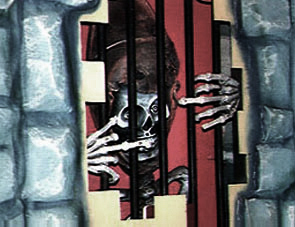 The façade, in addition to the skeletons riding choppers, contained a skeleton behind prison bars displaying a double “fickle finger”. Bill’s exact purpose for this and to who it was directed is unknown, but perhaps it was his way of getting the last word in an unpleasant dispute with the park owner, or it may have been just one of Bill’s practical jokes. No matter what the reason, his rebellious but humorous personality was evident. 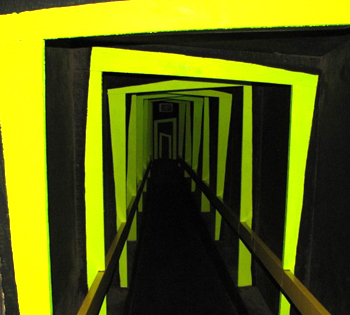 Kennywood Park in Pittsburgh, PA.
< Part VIII - Amusement Display Associates, Inc.